The Unibet Open kicks off season 11 at the Grosvenor Casino in London in the heart of British capital and the historic poker room is better known as ‘The Vic” among poker enthusiasts from near and far. It is the 7th ever Unibet Open to take place in London and last year’s 419 entries have set the record thus far. Belgium’s Gerret Van Lancker took home the lion’s share of the £229,150 prize pool and claimed the trophy and payday of £71,950. Van Lancker will be back in action to defend his title along with many familiar faces of the popular tournament series. The Unibet ambassadors such as Fredrik Bergmann, Ian Simpson, Dara O’Kearney, David Lappin, Espen Uhlen Jorstad and Daiva Byrne are all expected to join the action on one of the two starting days. Furthermore, the eSports stars will also take a shot at poker glory at "The Vic" after determining their champion in the eSports Battle Royale VIII SNG last night. 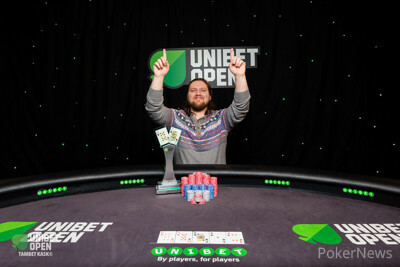 Thijs "Thijs" Molendijk emerged victorious and claimed the £5,000 first-place prize, defeating Phil "syrinxx" Schoenebaum in heads-up, who received £3,000 for his efforts. Last but not least, Scott "Sco" McMillan finished third and took home £2,000. Day 1a of the £990 Main Event kicks off at 11 a.m. local time and each of the two starting days will play a total of 11 levels of 60 minutes each with a break every two levels. There will be a dinner break after the end of level six, and all participants receive 30,000 in chips. The registration for the Freezeout tournament will remain open until the start of level seven and action is scheduled to conclude around midnight local time. Follow along right here on PokerNews as the live reporting team will provide all the action until a winner is crowned on Sunday, February 25th 2018.